Picture this: you’re having dinner and the lights go out. It’s a power cut, but you’re prepared. You go get a flashlight, flick the switch and… nothing. The batteries are dead. Now you’re stuck trying to eat spaghetti in the dark and worse, you’re wearing a white shirt. This all could have been avoided if you’d had a battery tester. We’ve put together a list of some of the best battery testers on the market so we can help you find one you like and prevent this situation from ever happening. Take a look at the table below. In it, you’ll find the name of each product we’ll be reviewing and the batteries it can test. We’re going to be examining each of these products in turn and noting any strengths or weaknesses they might have. 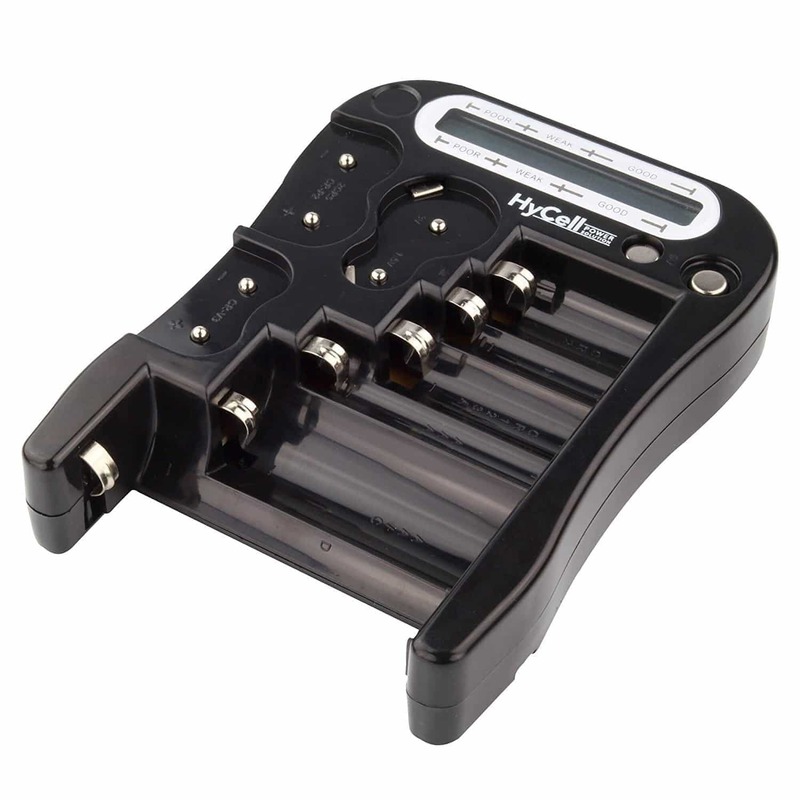 At the end, we’ll consider all of the information we’ve gathered and decide which battery tester is the best. 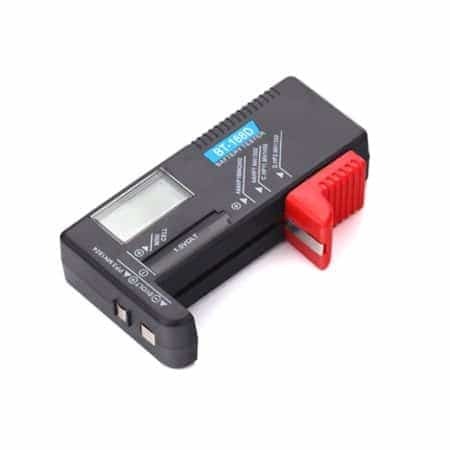 Since a battery tester isn’t likely to be something you use often, it makes sense that the lowest priced product would be popular. This product from HDE costs less than 4 USD, so it’s highly affordable. That doesn’t mean it’s a bad product, though: there’s actually a few good reasons to buy this model. It’s 4.2” wide, 2.2” tall and 0.8” thick, so it’s small enough to put in a drawer when not in use. It has space for a single battery, and can actually test a fairly extensive range of battery types. All of your standard battery types are catered for: AA, AAA, C, D, and 9V. 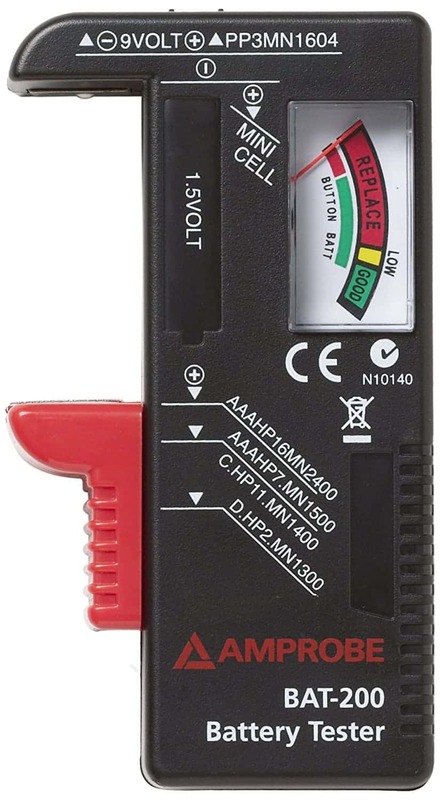 The current-voltage that your battery has is displayed on the 1.25” digital screen, although if it has less than 0.5V remaining, the unit won’t show anything. This is a good indication that the battery is completely dead. For context, a rechargeable battery is usually around 1.2V fully charged, and a regular one is around 1.5V. Obviously, for larger batteries, this number will be higher. One of the other great things about this battery tester is that it doesn’t require its own battery or power source. This is because it relies on the inserted battery for power. You don’t have to worry though: it only uses a tiny fraction of the battery’s power and as a bonus, this means that the tester is always ready to go. Now, as this product is so inexpensive, there are a couple of concessions that have to be made. Firstly, there’s no warranty coverage – if it breaks, you’re out of luck. Unfortunately, that’s not all. Secondly, it only displays the battery’s current voltage and won’t tell you if it can maintain that voltage under load. The readings are sometimes a little less accurate than we’d have liked. We found that it tended to show lower voltages than the battery actually had. So what’s our final opinion? 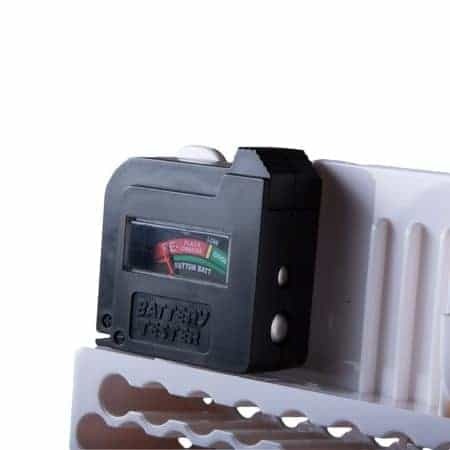 Essentially, this product will be fine for general use around the home or garage, but it lacks the precision required for professional applications. In short, this is a fairly decent battery tester. It’s nice and affordable, plus it tests a good selection of commonly used batteries. Although it does have a couple of features missing, for the price, it’s difficult to complain. 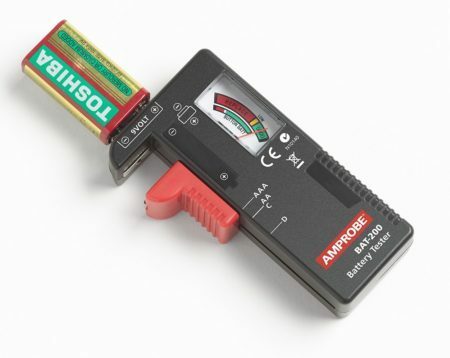 This battery tester from Amprobe costs around 6 USD, so it’s not the cheapest around. When it comes to a product like this, you might wonder what features come with an increase of just a few dollars. This product comes with a few improvements upon the last one, however. It measures the voltage in the same way, however instead of just telling you the current-voltage it provides context by means of a graph. Relax, it’s very simple. 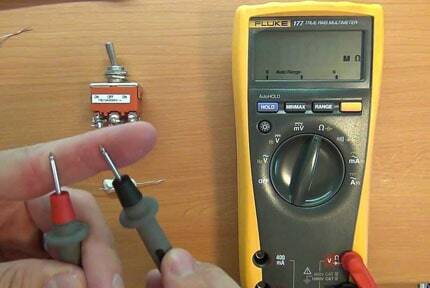 The higher the voltage, the further the needle lies to the right. The graph is color coded, green is good, red is bad. We all know that not all batteries are born equal too, and this tester even accounts for this. There’s a thin yellow line on the graph. 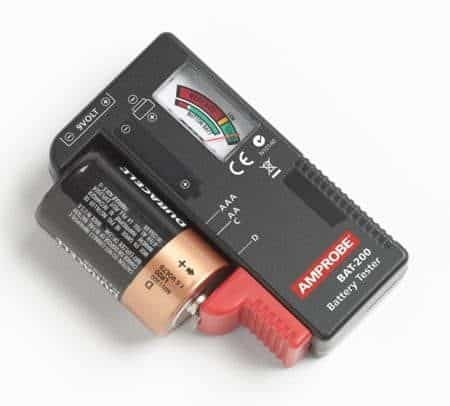 Amprobe say that this is the point where batteries can still be used in low-power devices like TV remote controls. This saves you from having to throw the battery away, thereby saving you money. It’s fairly precise too – the graph has 41 different segments all labeled with either “good”, “low”, or “replace” markers. This makes it one of the best household battery testers around. The positive terminal on this product slides up and down to accommodate batteries of almost any size. As long as it sits tight between the two terminals, it’ll work. All the usual suspects are accounted for: AA, AAA, C, D, and 9V, but this product can also test button batteries like the ones you’d find in a watch. That’s not all that’s great about this battery tester, though. This model comes with a one-year limited warranty. For around 6 USD, that’s peace of mind which most of this product’s competitors just don’t provide. It is a little bigger than the previous product we saw, but it’s still relatively compact. It measures just 7.3” wide, 3.5” tall and 1.6” thick so it’ll fit nicely into a drawer whenever you don’t need it. So what is our overall opinion on this product? We’re pretty impressed. 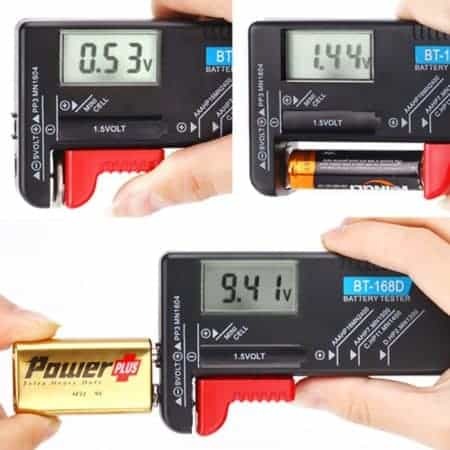 This is a really inexpensive product that provides the ability to test some of the most common batteries you’ll use around your home. It’s more precise than the least expensive product too, which is always a bonus. We really like that it encourages you to reuse batteries that are beginning to run low – this is something a lot of people don’t consider. Okay, so we’ve seen products which can test the most commonly used batteries, but what about if you regularly use some of the more unusual ones? 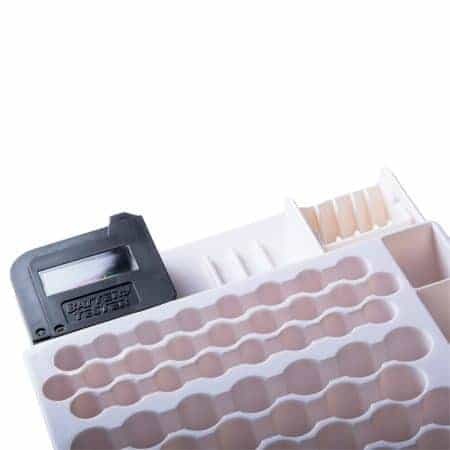 The HyCell 1900-0037 provides the ability to test these in seconds. All of the usual suspects (AA, AAA, and so on) can still be tested, but so can Micro AAA, button cells, LR1, and Mono D’s. This product includes one Micro AAA battery, which it uses for power. These batteries are a little unusual, and although it’ll last for a long time, it’s a good idea to buy some extras. If it runs out unexpectedly, you’ll be faced with an annoying and very ironic problem. So how much does a product this versatile cost? 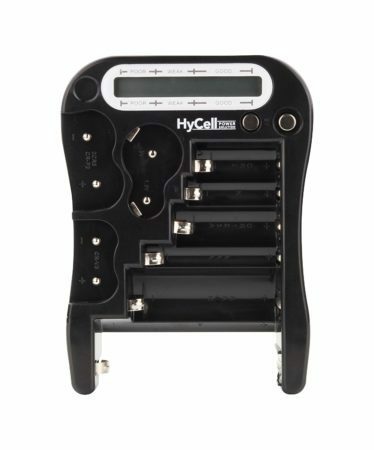 It’s probably less than you think – this HyCell retails for around 13 USD. Unfortunately, there’s no warranty coverage included. That said, it’s sturdily built and has a simple construction so it’s unlikely to break anytime soon. The good news is that even if one of the testing ports stops working, you can still test the other types of battery. The display is small but still good. It shows the current voltage of a battery on an 18 item scale. This is divided into “poor”, “weak”, and “good” categories, so you’ll be able to tell at a glance just how much charge is left. 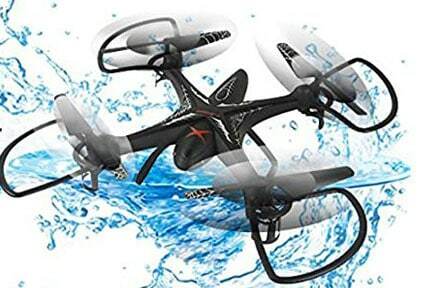 Now, even though this product has 14 battery slots, it can only test one at a time. The display doesn’t have any way to change which battery you’re looking at, which is unfortunate but not wholly unexpected. This is one of the most compact battery testers we’ve seen. It’s only 4.6” tall, 3.5” wide, and under an inch thick. This means that it’ll fit neatly into a toolbox, drawer, or even a glove box. It’s the perfect battery tester for taking around with you on a job. So, knowing what we know, how do we rate this product? There isn’t a whole lot to complain about if we’re honest. 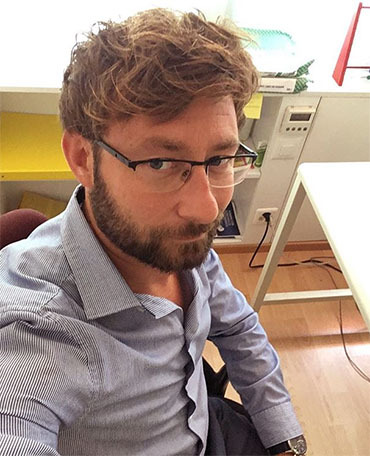 It’s a fairly straightforward product that does what it sets out to do. It would have been nice to be able to test multiple batteries at the same time, however, this isn’t a deal breaker by any means. It just means that testing multiple batteries takes a couple of extra seconds. There’s something a little different about this product. It’s not primarily a battery tester, but it does include one. 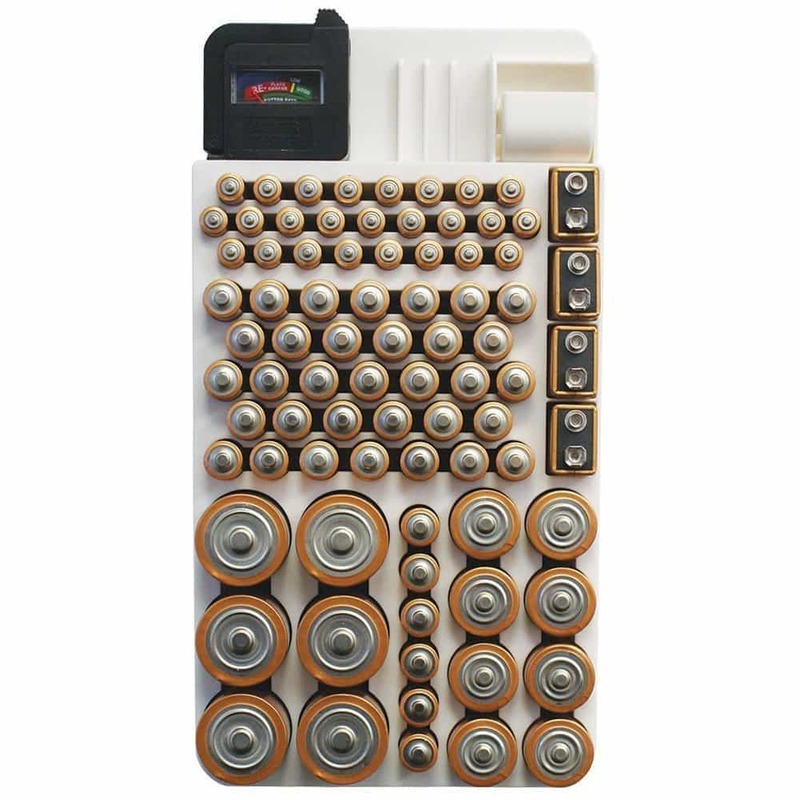 It’s an 82-slot battery organizer, designed for people who have loads of batteries in all different sizes. 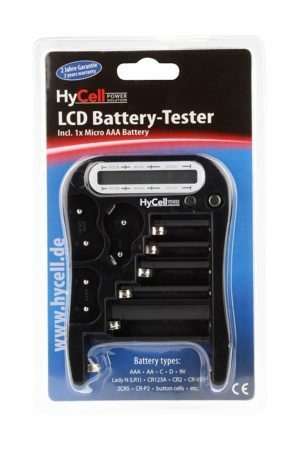 There’s a removable battery tester included that can test AA, AAA, C, D, and 9V batteries. 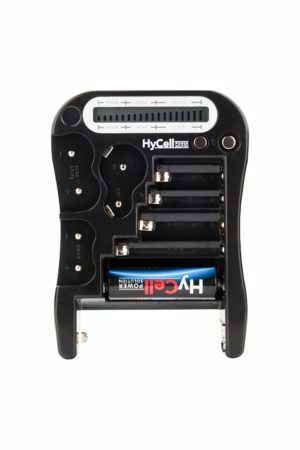 This tester doesn’t require its own dedicated battery – it uses the battery that’s being tested as a power source. 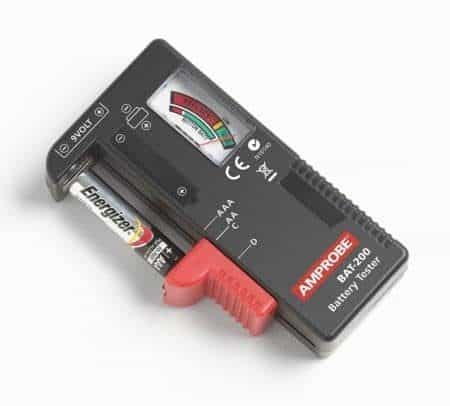 The battery’s power is measured using a needle graph similar to the Amprobe tester we saw. It’ll either be in the green section, which means it’s near full, yellow, indicating it’s running low, or red, meaning it’s going to fail soon. 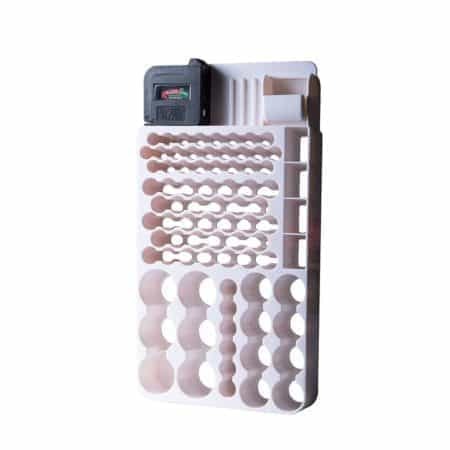 The organizer can hold all of the batteries that it can test, plus it has a drawer for smaller batteries like the ones found in watches or hearing aids. This is great for people who like to tinker – people like watchmakers or hobbyists. It’s not particularly expensive, either. It retails for around 15 USD, which is next to nothing considering that this is both an organizer and a battery tester. So, now you’re probably wondering where you’d even put a product like this. It is pretty large, after all, at a square foot in size and almost 2” thick. Don’t worry – this product has one more trick up its sleeve. Sure, if you have a large enough drawer, it’d fit in nicely. However, this organizer is also wall-mountable. It comes with all the wall anchors and mounting screws you’ll need to attach it, saving you a trip to your local hardware store. If we had to find something to complain about, it’d be this model’s lack of a warranty. We understand that it’s not expensive, but it still would have been nice to see a little consumer protection thrown in. Due to this product’s low price, it isn’t made of high-quality materials. The organizer is lightweight plastic, so if it was to fall off of the wall, there’s a pretty high chance it’d crack. This would have been a great opportunity for Range Kleen to show their buyers that they value their custom. All things considered, though, it’s a pretty decent battery tester. The inclusion of an organizer is a bonus, and even if you never use it, you’re still getting a good deal. There are few things in life worse than getting ready for work in the morning and discovering that your car battery is dead. The BT-100 battery tester from Schumacher can help prevent this. It’s a little more expensive than any of the other products that we’ve seen, but it’s far more versatile. It costs around 20 USD but can test both 12V and 6V batteries. Unlike its competitors, this tester measures battery load, its starter motor draw, and diagnoses any charging problems that the battery might have. The display is large and very easy to read. It’s split into two parts: one for testing 6V batteries, and one for 12V. There are even instructions printed warning you not to test batteries for more than ten seconds at a time – these are important, so make sure you follow them. It is a fairly large product. It measures 15.1” tall, 7.5” wide, and 3.6” thick, plus it weighs 2.7 pounds, so you’ll likely need somewhere to store it. Connecting it to a battery is very simple: it’s basically the same as jump-starting a car. You just connect the red and black clips to the correct terminals on the battery and flip the big red switch. 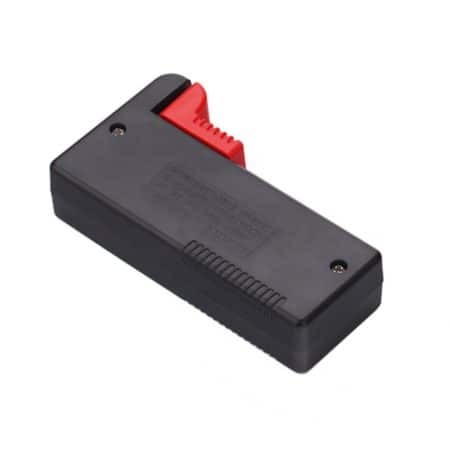 Because this product tests 6V and 12V batteries, it can be used on almost any vehicle battery. Cars, motorcycles, and even boats are covered – you’ll always know exactly how much charge your vehicle’s battery has. So what are our final thoughts on this product? Well, obviously, this is a tester for larger batteries. It’s incapable of testing your commonly used household types like AA, C, or D. It wasn’t designed to, though, so we really can’t fault it for that. We really liked that it performs more advanced tests than any of the other products we’ve reviewed: for a lot of people, their vehicles are their livelihood and approximate battery levels just won’t cut it. 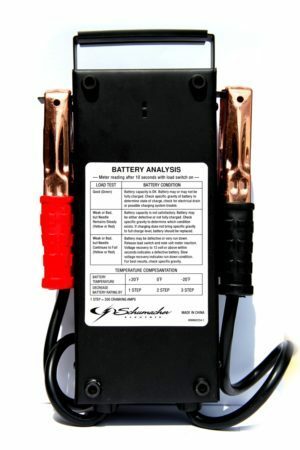 In short, this automotive battery load tester is great for people who drive a lot or who have a recreational vehicle at home. For around 20 USD, you can have complete peace of mind and know that you’ll never end up stuck out on the highway or worse, the water. All of the products we’ve seen today are great in their own way, but now we have to decide which of them is the best overall. It was a tough decision, but we’ve concluded that the HyCell 1900-0037 will be more useful to most people. It tests some of the most commonly used batteries as well as some of the smaller, less seen ones. For less than 15 USD, there aren’t many products that have the same level of precision. 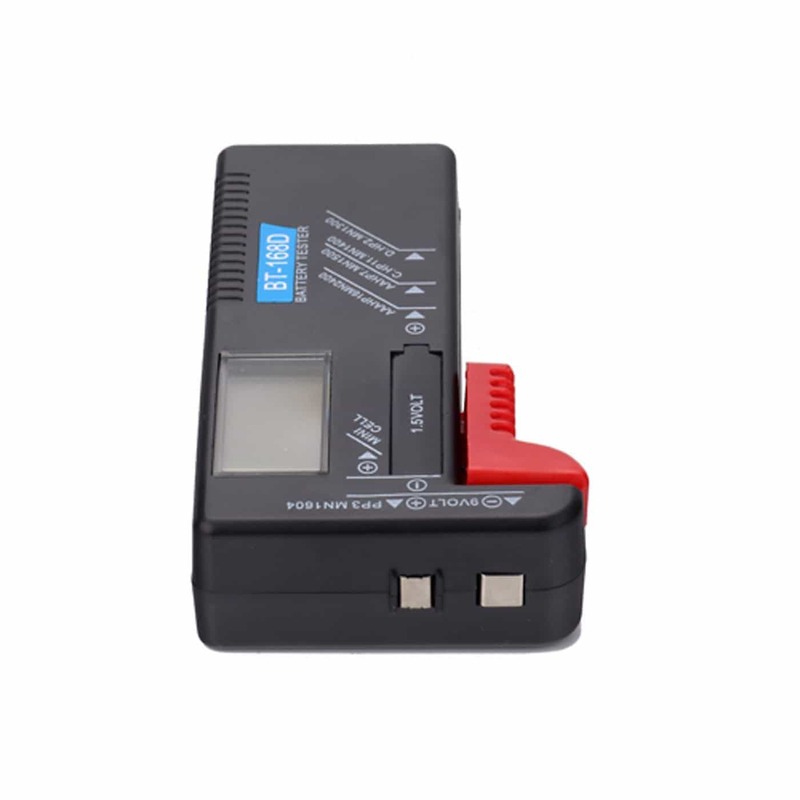 As such, if you’re looking for an affordable and versatile battery tester, this is the one to choose. Now that you’ve read our guide about the best battery tester. Take time to read about how to speed up your internet connection, this guide might help you to solve your internet connection problem.